I should have known that “Divergent” would be all over the place. I did not read the book and I don’t know if that makes me special or just like everybody else. Tris (Shailene Woodley from “The Descendants”) is tested to determine which of the five factions she is best suited for. She was raised as Abnegation, who are in control of the government. However, Erudite, a faction led by Jeanine (Kate Winslet from “Labor Day”), wants to take over. When Tris’s test is non-conclusive, she chooses Dauntless to everyone’s surprise. I hope you are following this. You see, a hundred years ago, after “the war,” they decided the only way to prevent conflict and keep the peace was to divide everyone up into the five factions. So, based upon your virtues, you may be: Candor (the honest), Abnegation (the selfless), Dauntless (the brave), Amity (the peaceful), and Erudite (the intelligent). It’s a good thing patience is a virtue because it is a long movie. 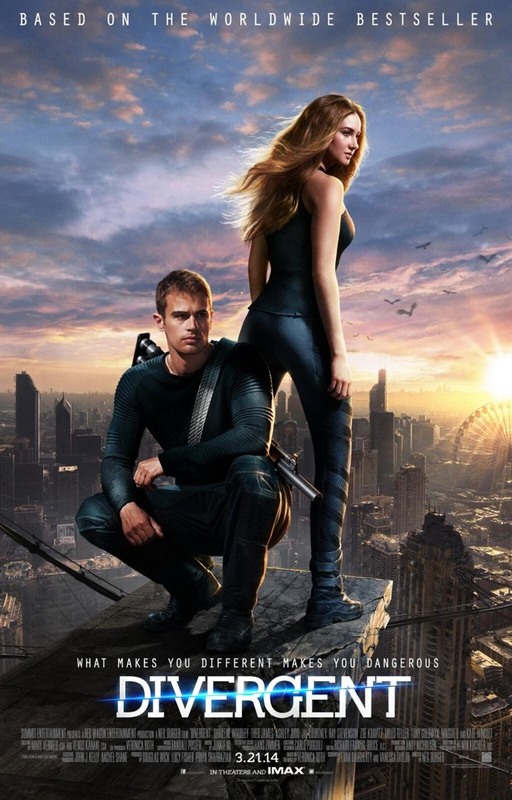 The reason Tris’s results were bad is because she is Divergent, which means she has all of the virtues. It was so much easier in Harry Potter with that sorting hat. I was told this was like “The Hunger Games,” but not that much. I did have two bags of popcorn, so it did make me hungry. The training is rough in Dauntless, especially for Tris because they want soldiers who take orders and she is more of a rebel. One of the instructors, Four (Theo James from “Underworld: Awakening”), that is his name, looks out for her because he thinks she is special. Of course, she is, and in this world “what makes you different makes you dangerous” (tagline). This was a decent sci-fi piece, without all the space ships and robots and special effects. You can see the seeds of this dystopian future all around us now, with people being labeled in different groups like conservatives, liberals and trekies. I liked how Tris worked though finding her place. The movie did have a nice third act, but I started to get a whiff of trilogy. It felt just like when I used to watch the Rockford Files and it would end with “to be continued.” Sure enough, there are two more books and probably two more movies. Maybe I will find out if Dauntless is really, well – dauntless. As for this movie, I must give it 3 ½ stars out of 5. I guess in the next movie we will find out how special and how dangerous Tris will be.